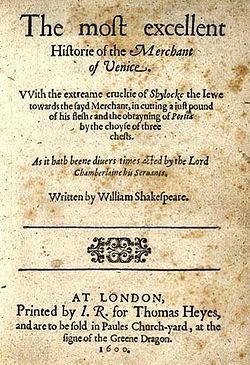 As we retreat to invocation of the saints, we might recall that it was on this this date in 1598 that The Merchant of Venice was entered on the Stationer’s Register. The copyright regimen was strict in Elizabeth’s time, as is now. But back then, copyright was literally that, the right to make a (first) copy: the Queen, concerned with sedition and determined to keep a tight rein on any and all published material in her realm, had decreed that no work could be printed in England without a license from the Stationer.